Carve the pheasant and serve with the bacon, game chips and cider sauce. Wilted chard or spinach makes an excellent accompaniment. 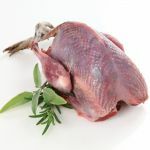 Preheat the oven to 180C/gas 4Smear the butter over the pheasant, season with salt and black pepper and layer over the bacon. Roast for about 1 hour and 20 mins. Test to see whether they are cooked by piercing a leg at the point where it joins the body - if the juices run clear, it is ready. If not, pop back in the oven and test again after 10 minutes. Cut the potatoes into thin slices. Heat the oil in a deep fat fryer to 180C. Cook the potatoes for 4-5 minutes, until golden brown. Drain and place on several layers of kitchen paper to absorb excess oil. Sprinkle with salt and keep warm. A great dish, available now.